Donating safe blood means you are committed to participating in a vital community service to improve the quality of life, for patients in need of blood transfusions. 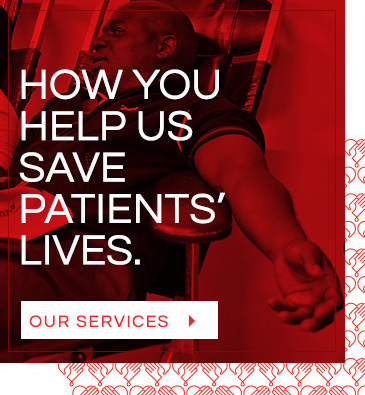 The South African National Blood Service (SANBS) has various measures in place to protect the health and wellbeing of blood donors and patients. These measures ensure that our blood supply is among the safest in the world. You will be required to complete a Donor Questionnaire. The questions are aimed at assessing your health and lifestyle to eliminate any effects that could pose a risk to your health and the health of a recipient. This is followed by a one-on-one interview with the nurse who goes through the questions to ensure that the questions are understood and that the donor understands the importance of being honest on the questionnaire. We then examine your arm to find a suitable vein and clean it with an antiseptic sponge. We will insert a needle in your arm which will collect your blood into a blood bag with your unique number. We only use new, sterile needles which are used once and incinerated thereafter. A scale weighs the blood and stops when you have donated 480ml. This usually takes between 5-10 minutes. In addition to the blood bag donated, 3 small vials of blood will also be collected. This is what goes through for testing with the unique number that refers back to the blood donated. The needle will be removed and a sterile dressing applied to your arm. The blood donation process takes about 30 minutes from start to finish. You are requested to lay down for a few minutes once you have donated. Increase your fluid intake for four to six hours after donation. Avoid strenuous physical exercise or heavy lifting with the arm used for donating for two hours. Do not smoke for at least half an hour after donation. You can donate blood every 56 days and we would like donors to commit to regular blood donation. This means at least four donations during a two-year period. This will assist in ensuring a safe and sufficient blood supply. Remember – don’t wait, please DONATE! 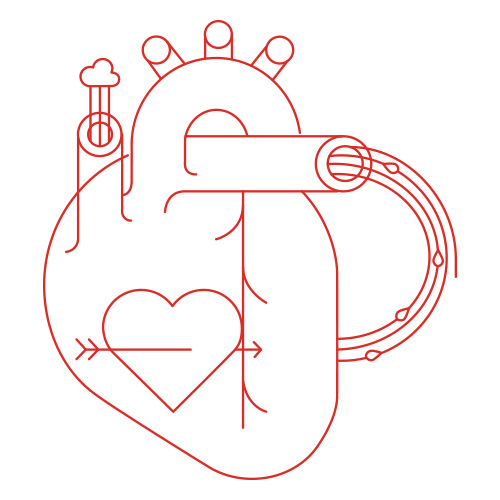 The universal access to safe blood is the lifeline for the healthcare system of any nation. We can all be proud of the dedicated and selfless South Africans who regularly donate their blood to save the lives of thousands of other people every year. Not much… for the vast majority of people the process of giving blood is a simple, trouble-free and a positive experience. Blood donors can’t wait for their next donation and feel good knowing that they are saving lives. Bruising or a painful arm. Keep in mind that this happens in less than 2% of donors. You can be assured that staff is fully trained to recognise and manage all complications related to blood donation. Another unintentional consequence of donating blood is iron loss which may lead to or aggravate anaemia. 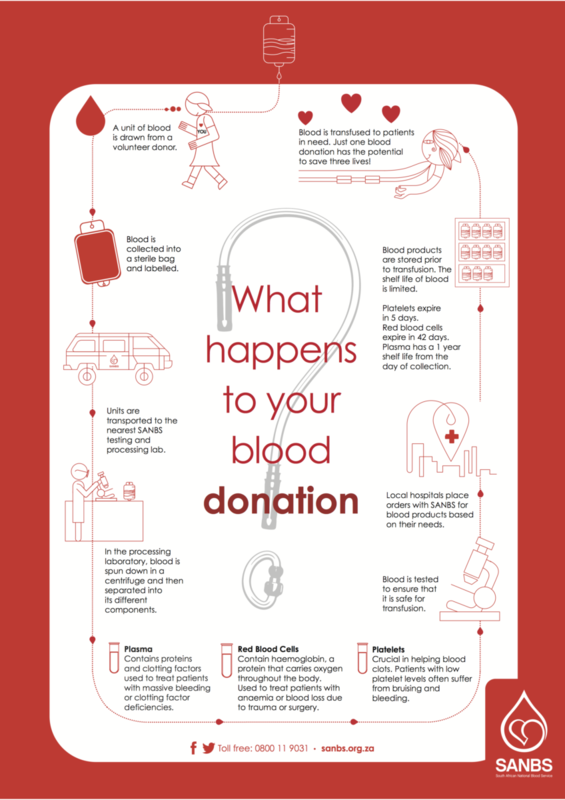 While most donors are able to easily replace the iron lost during blood donation, some donors struggle to do so. This is especially true in females of childbearing age as well as vegetarian donors or any donor who follows a low iron diet. Such donors should consider donating less frequently, eating iron rich foods regularly or taking iron supplements. Less than 5% of blood is used as whole blood (the way you donated it). By separating the other 95% into its components; red blood cells, platelets and plasma, the unit you donated can save up to 3 lives. Which is wonderful considering the whole process takes only about 30 minutes. Your platelets can be used for a cancer patient, plasma to replace clotting factors in a trauma patient and your red blood cells for patients who needed surgery or suffered complications during childbirth.